After a recent trip to Taos, New Mexico, I came back to Texas with a love of all things turquoise. It probably didn’t help that my fiancé bought me the turquoise necklace that inspired this embrace. But nevertheless, I often am finding myself turning to turquoise while planning my own wedding. While turquoise is normally always seen with silver, gold brings out an extra richness in the turquoise taking it from an everyday stone to something much more unique and glamorous. 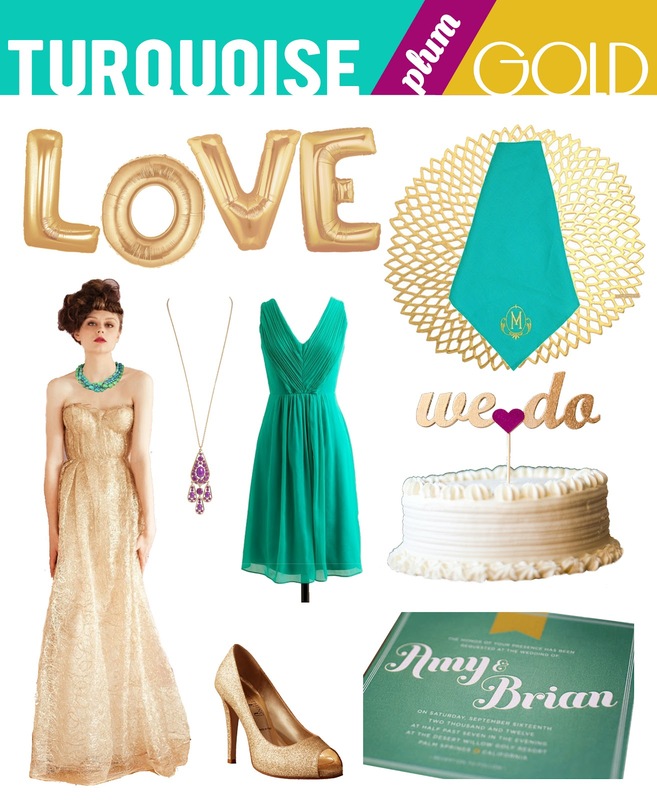 Gold and turquoise are fabulous compliments both enhancing the each other without either stealing the spotlight. Also as a side note, a wonderful accent color to this dynamic duo is the unassuming plum. While rich in its own right, plum also serves to soften the boldness of turquoise and gold. This wedding color palette would be beautiful for a late summer wedding. Rich with a touch of bohemian, it would be sure to leave everyone stunned.